Wash the cherries and remove the seeds. In a pan, add the cherries with sugar and cook till you get a thick sauce for about 5-10 minutes. Remove it from flame and allow to cool. Then puree to a smooth sauce using a blender and strain it and keep it aside. In a bowl, add the condensed milk and chilled whipping cream and whip till you get stiff peaks. Now add the strained cherry sauce and mix well using a whisk or electric beater. Transfer it to any freezer safe container, cover and allow to freeze for 1-2 hours inside the freezer. 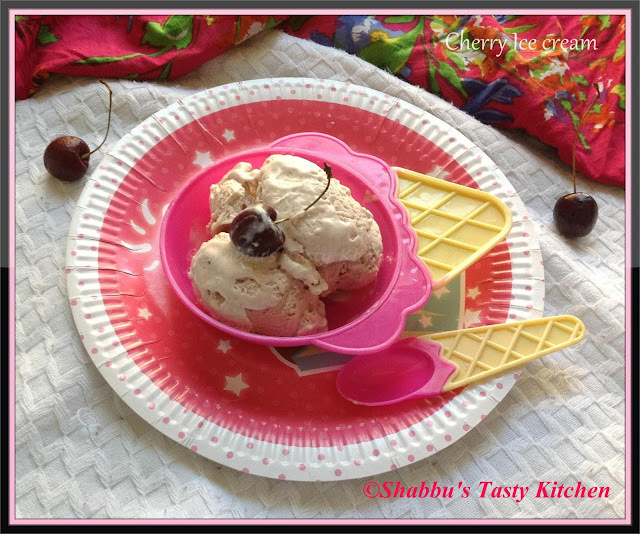 Then remove the container from freezer and whip it again, cover and freeze overnight or minimum 4 hours...Keep the ice cream container out from the freezer 5 minutes before serving..
Ice cream with cherries a real treat in summer.